It occurs to me that Body Boss has a great story. A great story of why we’re here today with Body Boss trying to disrupt the “industry” of Team Strength and Conditioning. Darren Pottinger really started us on this path back in 2010/ 2011 of bringing more intelligence to working out – bringing regression and statistical modeling/ forecasting to training with a simple Excel model… yet can be built better and stronger. Being the zealous and extraordinarily gifted problem-solver and programmer, Don Pottinger joined in on the fun looking to build the spreadsheet into something greater – an app for the masses. For several months, the brothers Pottinger iterated, and it was in the fall of 2011 when Andrew Reifman joined the team to bring his black magic of Design Creativity to the fold. Andrew and Don were long-lost friends from Dunwoody High School. After learning Andrew had built award-winning sites while working at various design agencies, Don asked Andrew to join. Definitely loved his personal website. I mean, how do I get little power bars like the X-Men cards I used to collect??? This Andrew guy is LEGIT. I’m not sure when I really joined because I was consulting and always traveling. Tell you what – if you can travel while trying to do your own startup, props to you because I don’t recall when I was adding value on a consistent basis. SO enter me, Daryl sometime in that glorious assembly of the Dream Team. Having played soccer at Tech with Don, we had become best buds for a while. I bring to the field the execution and drive as well as some patience for the business administration – makes sense since I was entering Emory University’s Goizueta Business School in the accelerated One-Year Full-Time program May 2012. 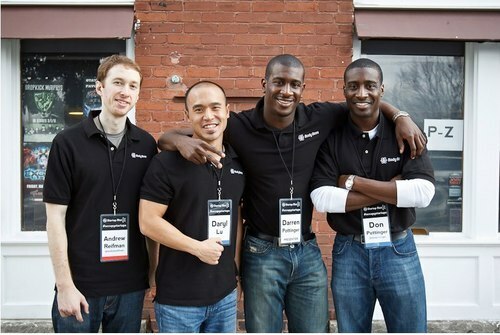 Gifted with an extraordinarily talented team who also lived and breathed personal fitness, we entered Startup Riot as one out of 30 startups competing in a pitch-off of sorts in Atlanta in February 2012. Many to this day will never forget our presentation where Darren stripped off his shirt to the hoots and hollers and affection of women… and men. We were voted into the Top 5, and at the time, we were aiming to be a B2C company. We were going to build an app based on the principles of intelligent personal fitness leveraging the growth of mobile and technology. Though, we didn’t even have a product to show. All we had was a dream. After meeting with Georgia Tech and re-evaluating our strategy, we decided to shift to the B2B market – focusing our efforts on helping improve the feedback loop between Coaches and Players in sports teams and organizations. As we reflect on our own past experiences, workouts were disseminated from Coaches to Players via sheets of paper and rarely, if ever, were those workout results ever returned to the Coaches. Even rarer was when the Coaches would take those sheets of workout results and plug them into something like Excel spreadsheets. Tracking pieces of paper, writing it all down, transcribing the number into Excel… that’s about a 2-3 minute process for a single player. If you’re a Coach of a team with 50 players, you can do the math and that’s a lot of wasted time. Add to that other competitors’ focus on just the Coach… that’s not how TEAM sports are played. We wanted to create a tool that engaged everyone on the team from the Coaches, Trainers, and the Players. Afterall, Players are the ones who have the execute come game time. That’s when Body Boss was really born. We built towards a vision without actually talking to too many other players or Coaches, but in August, we met with the Athletic Director of Centennial High School in Roswell, GA where we presented the initial design and vision of Body Boss. Excited for what we were working on and seeing an immediate value, he invited us back after a few enhancements. In December, we really locked in with the Head Football Coach and Head Baseball Coach at Centennial High School to trial Body Boss with their players starting January. Everything since then has been… shall we say, history.